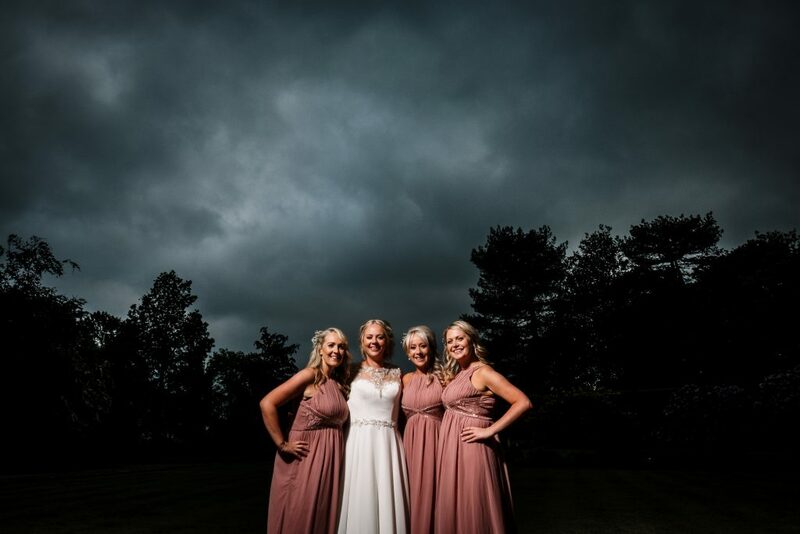 This was an unexpected wedding for us because we weren’t meant to be there. 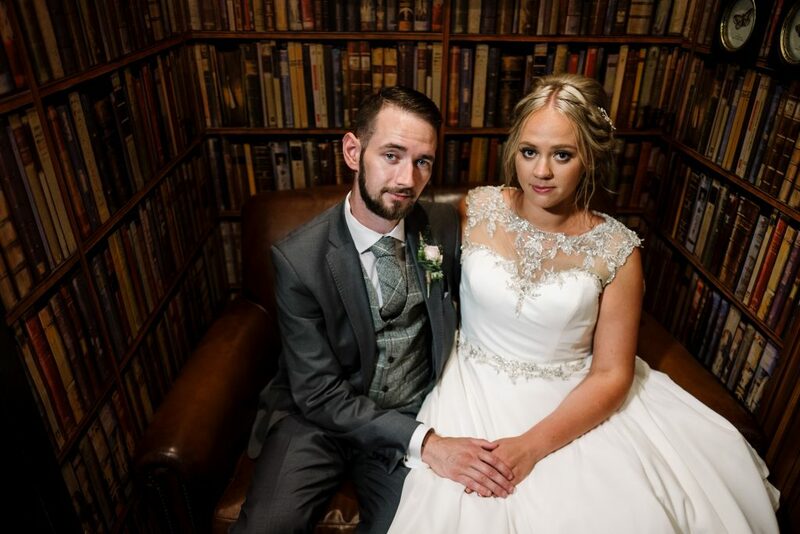 Stuart from ‘Sands Photo’ asked if we could help him out as his wife had an operation and was unable to shoot the wedding. 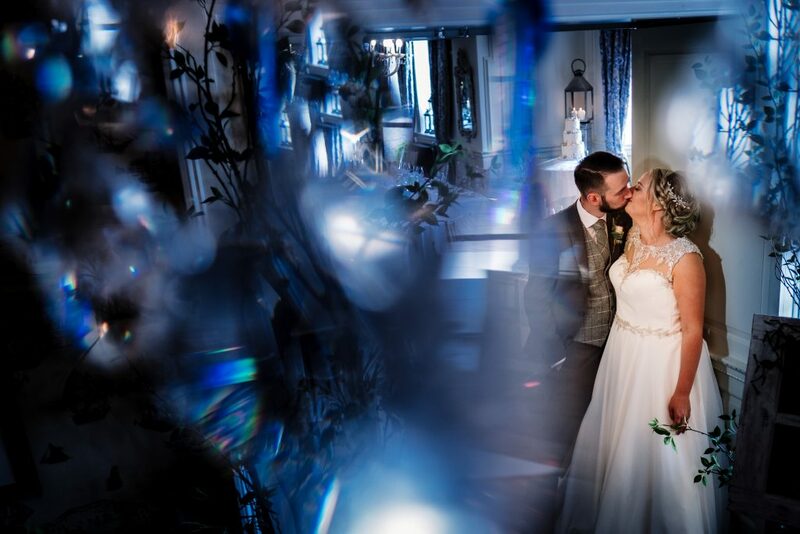 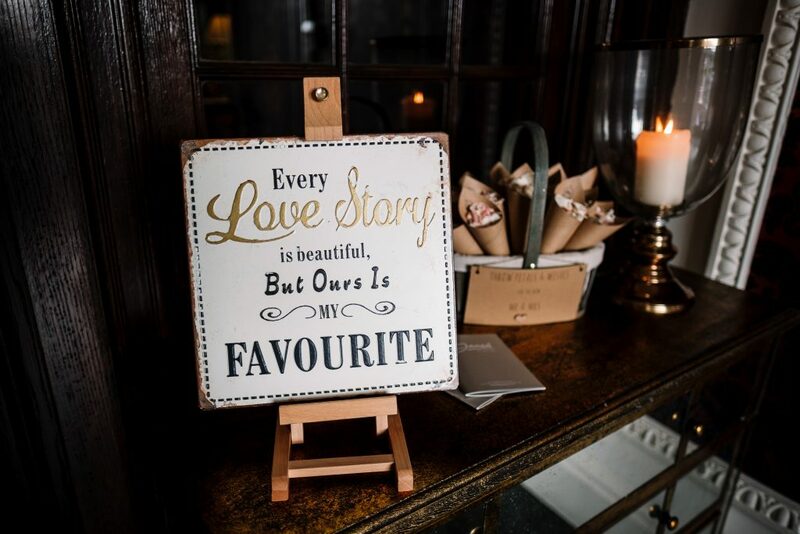 With it being a Tuesday in half term luckily the stars aligned and we got to photograph this fantastic wedding. 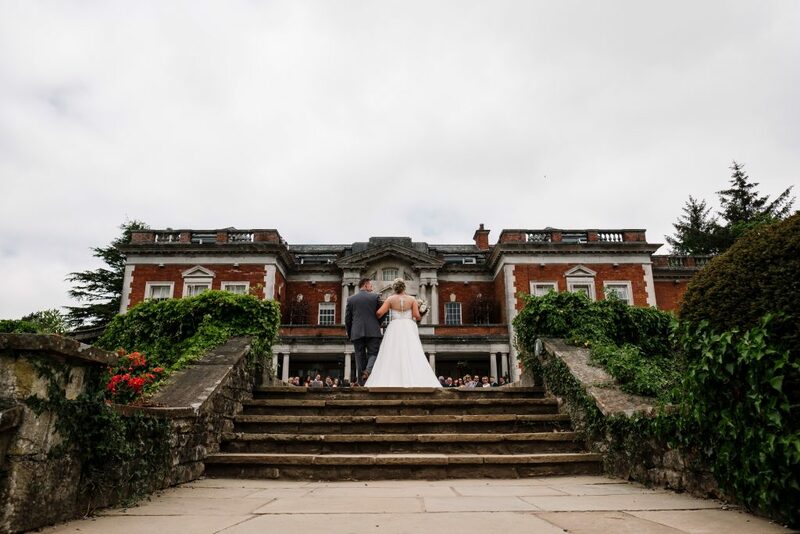 It was so good to be back at the stunning Eaves Hall on this beautiful summers day. 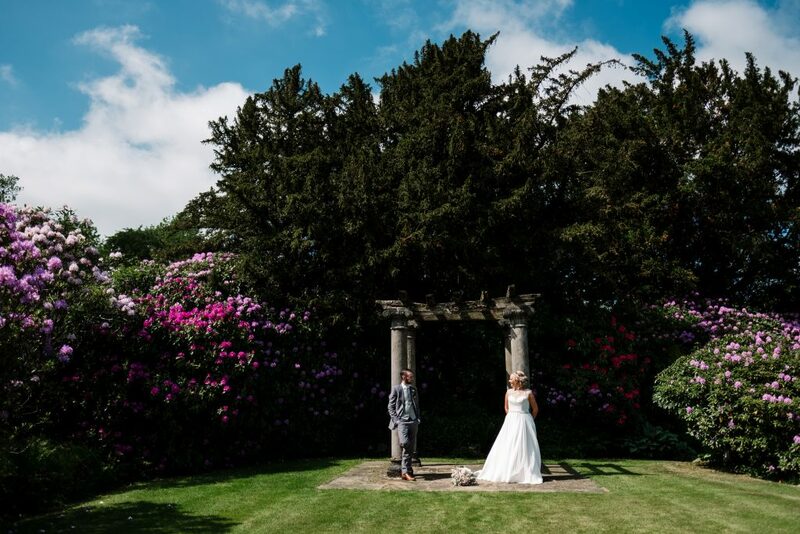 It was also great to get to photograph an outdoor wedding ceremony in such a beautiful wedding venue. 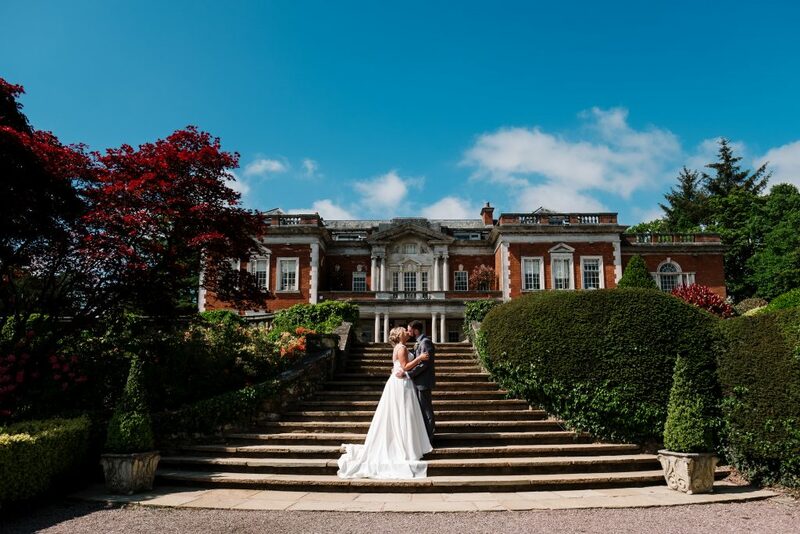 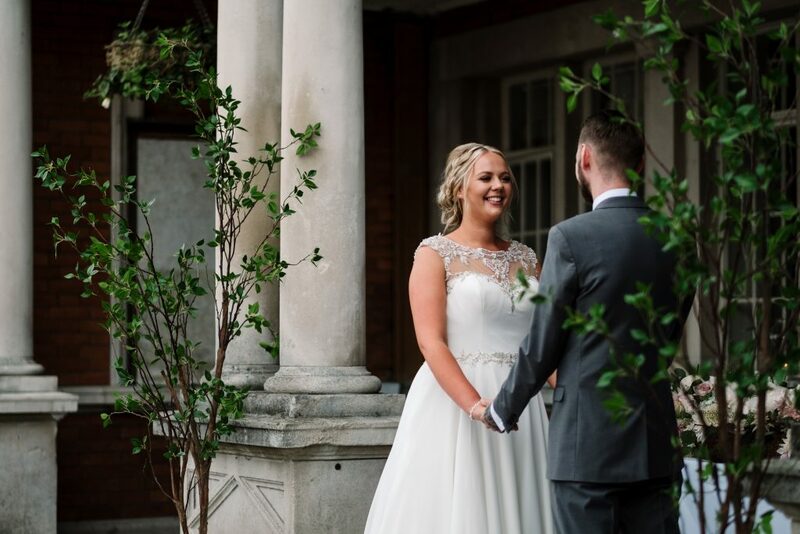 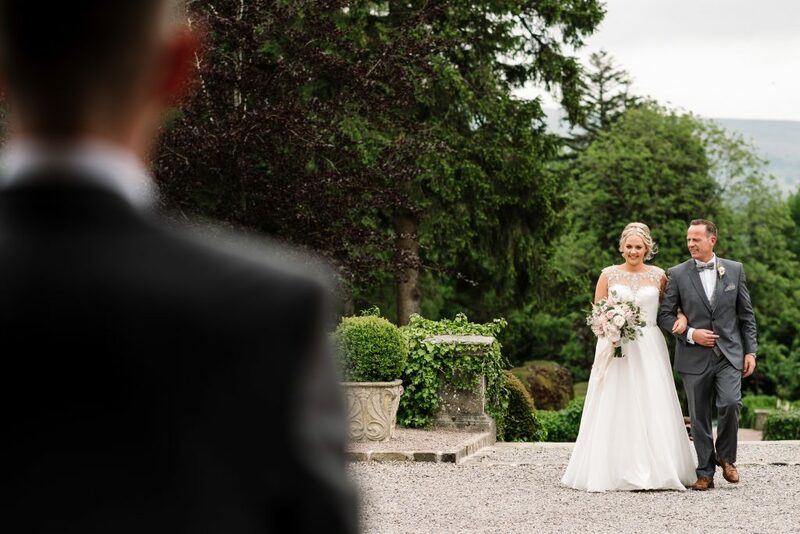 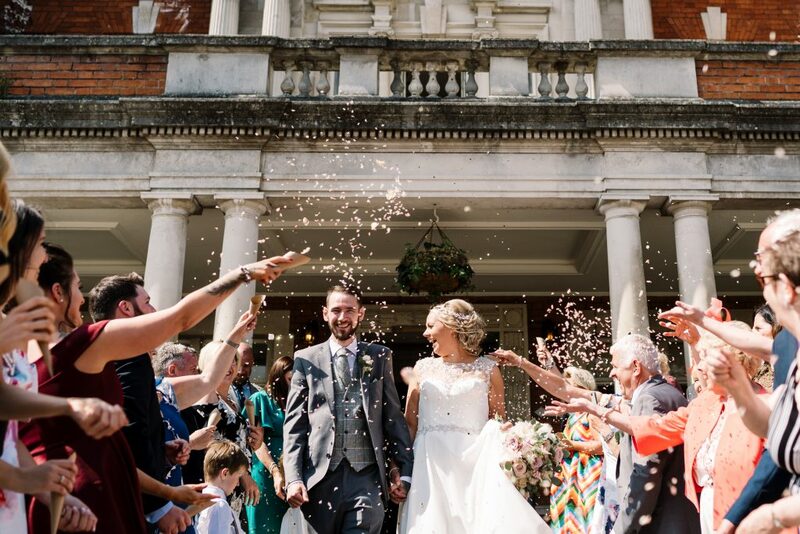 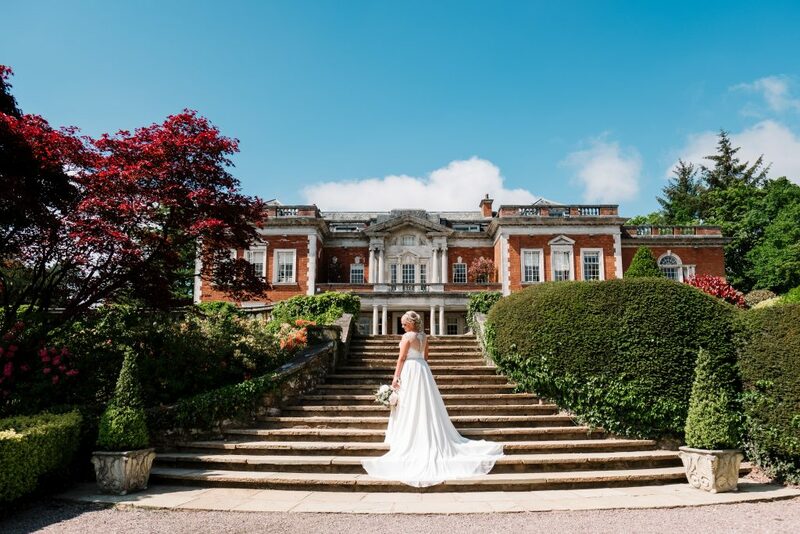 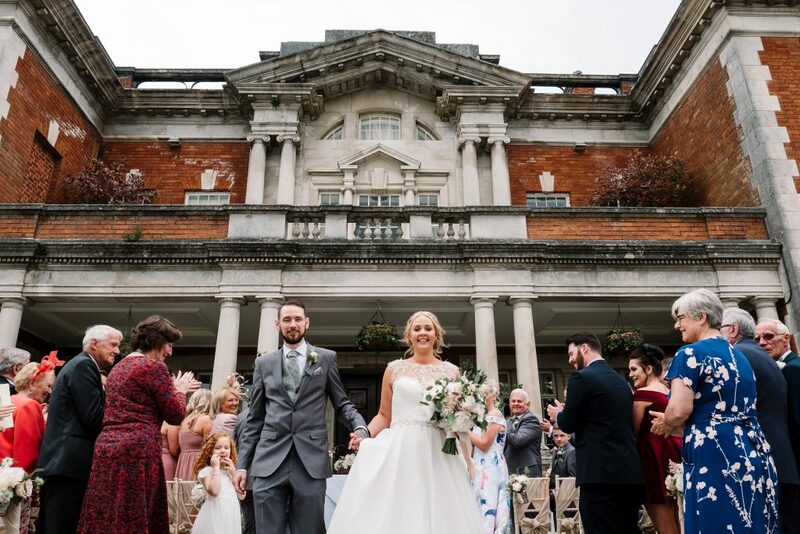 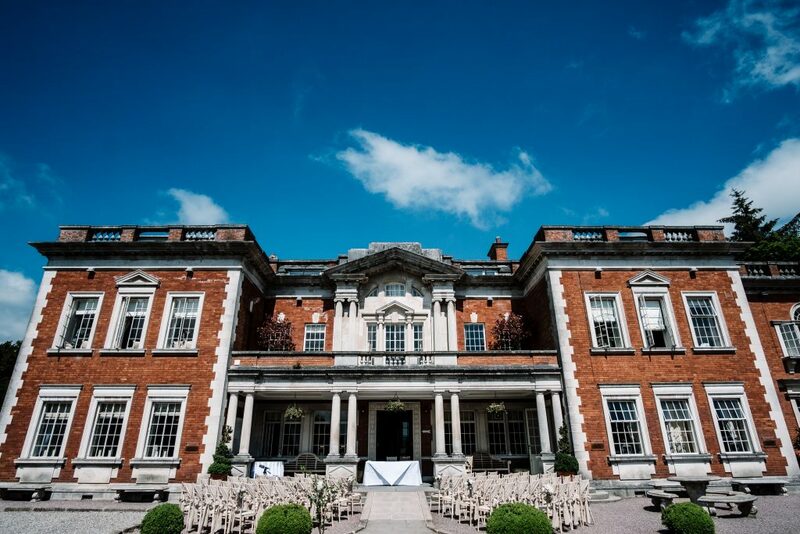 Outdoor weddings in the UK can be tricky with the weather, and sometimes the ceremony ends up having to be indoors, but the clear blue skies meant bride and groom were able to get married outside of this picturesque Georgian mansion surrounded by elegant gardens. 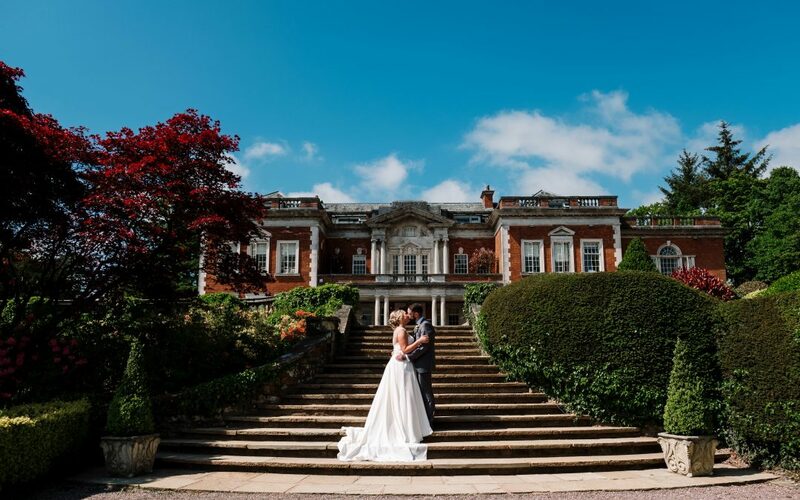 The perfect setting for a romantic wedding! 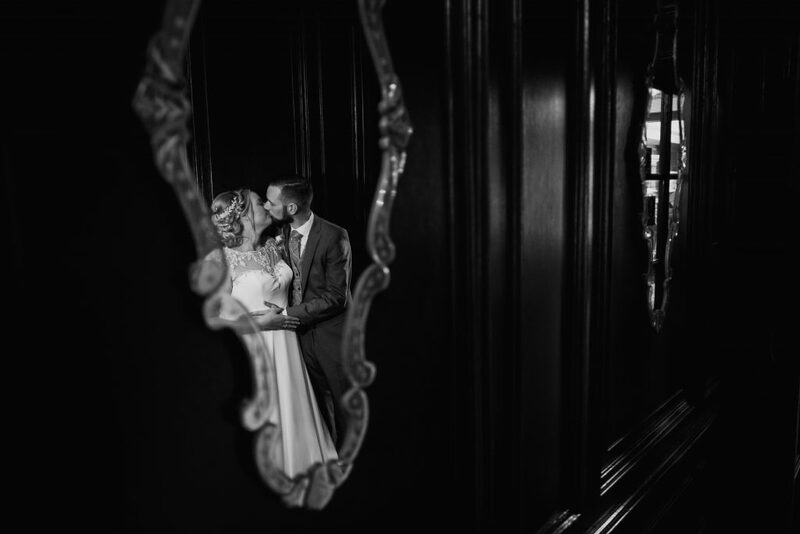 Chelsea & Ian are a fantastic couple and it was a pleasure to capture their big day. 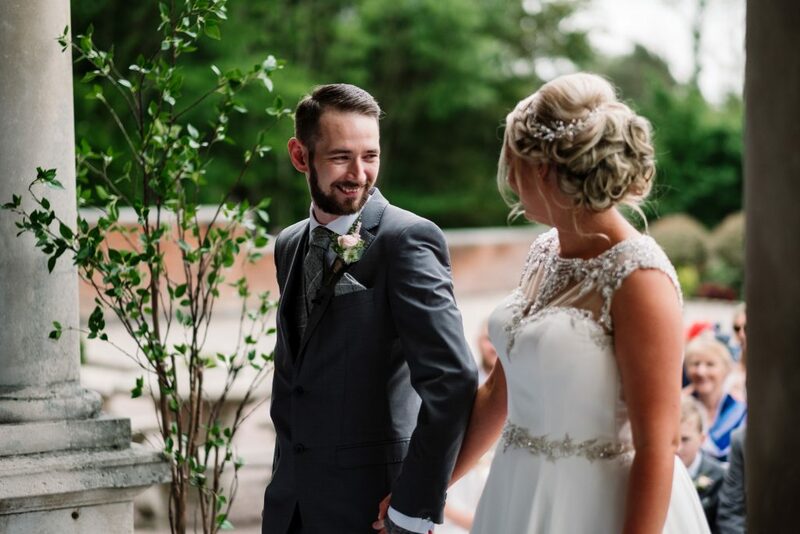 Huge congratulations guys. 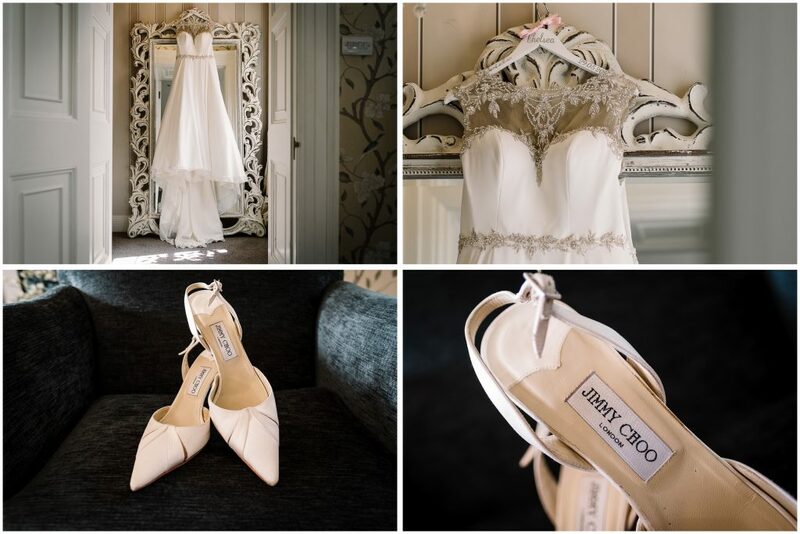 One of the things I love about this venue – there’s plenty of space to shoot details of the wedding dress and shoes. 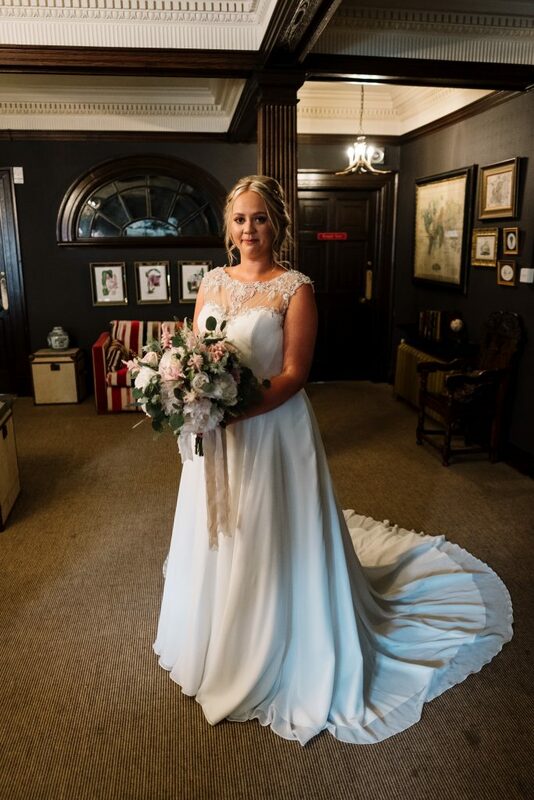 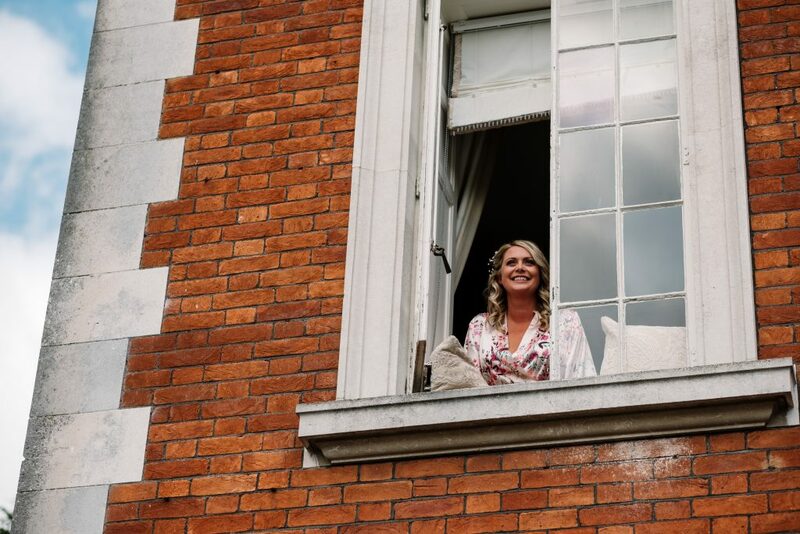 The photos above were taken in the bridal suite at Eaves Hall. 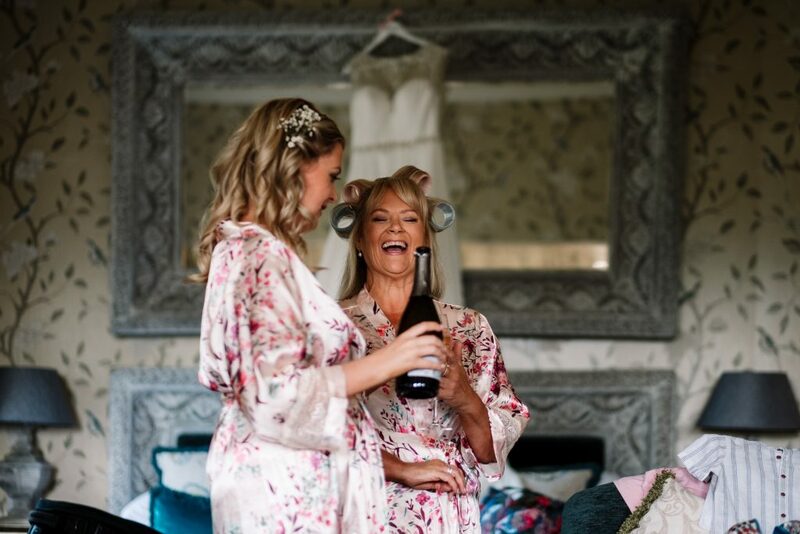 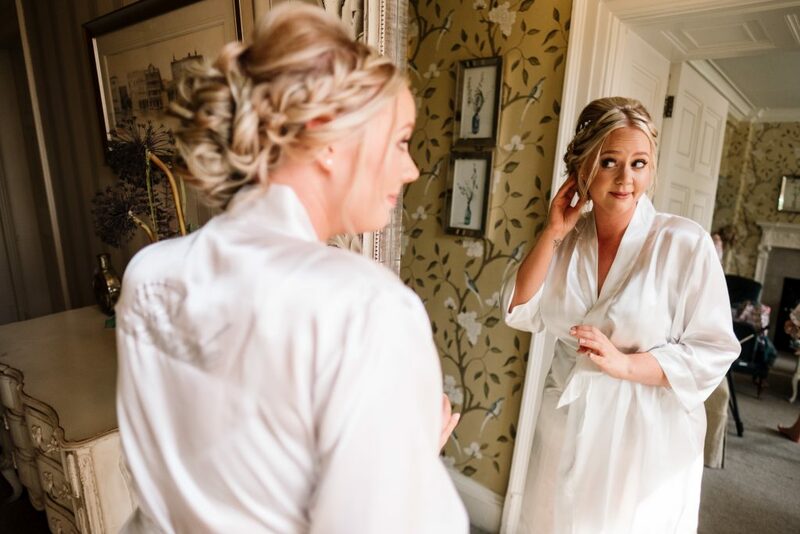 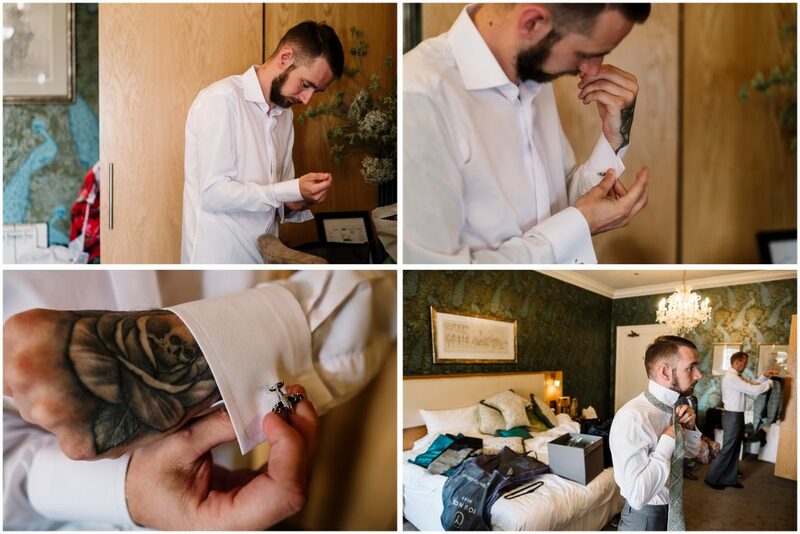 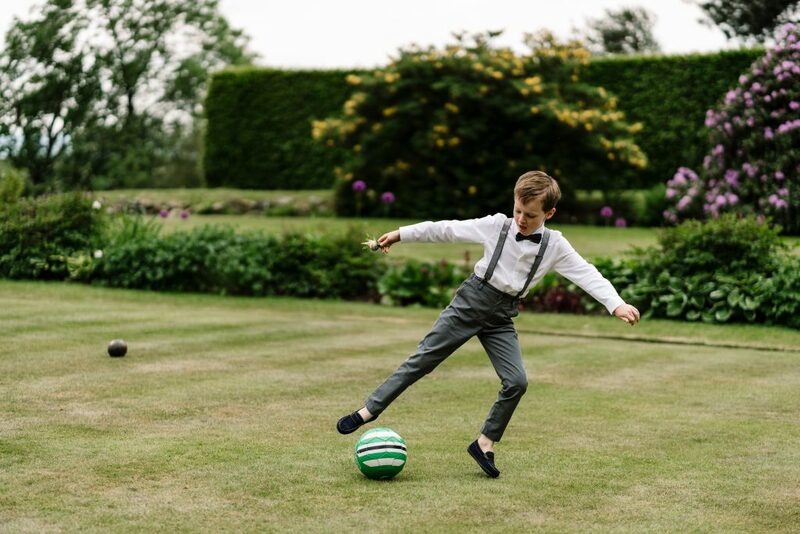 The room styling has a real classing, vintage feel, which provides a timeless backdrop for your getting ready photos. 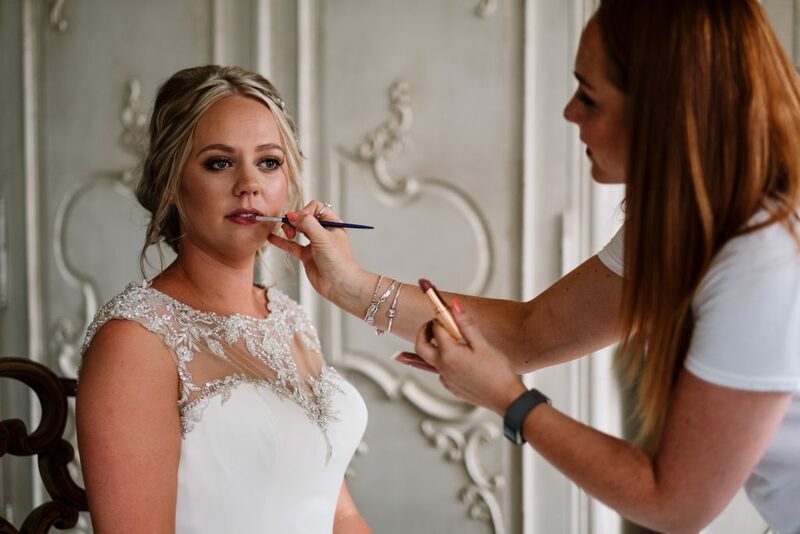 Chelsea’s wedding make-up artist was the talented Jodie Smith. 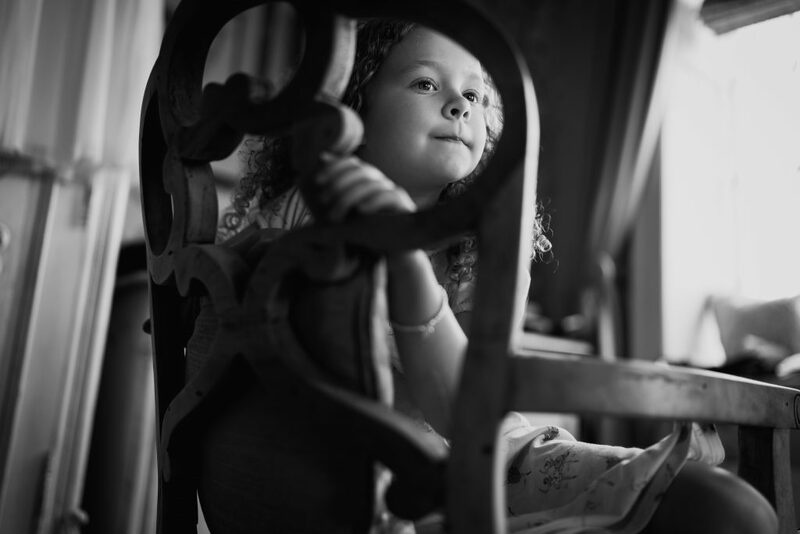 I really enjoy working with her! 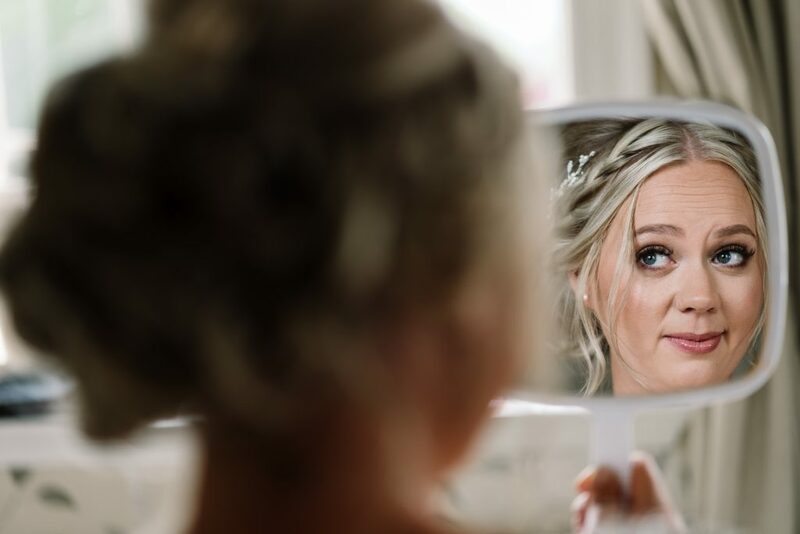 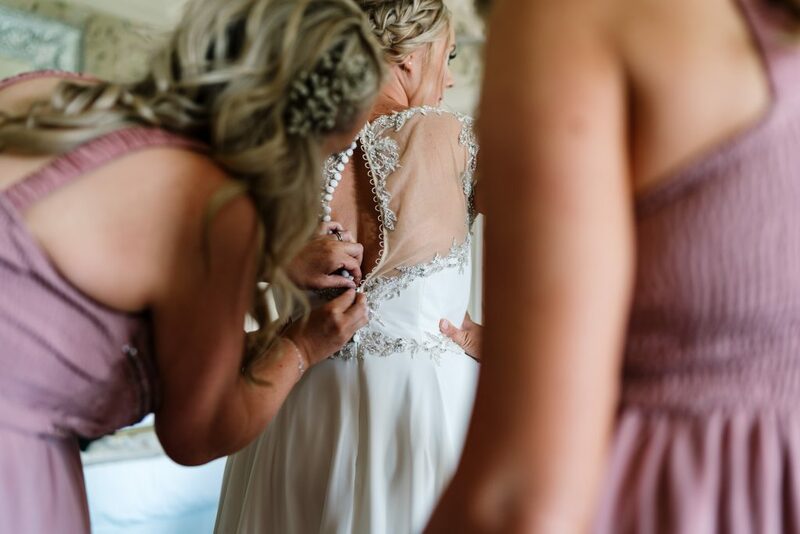 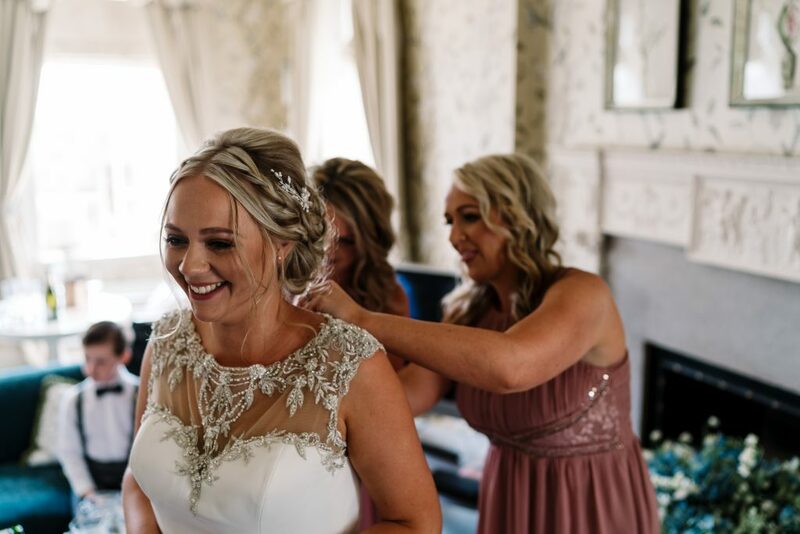 She has a relaxed and friendly approach and I know the make-up will still look great for the photos well into the evening. 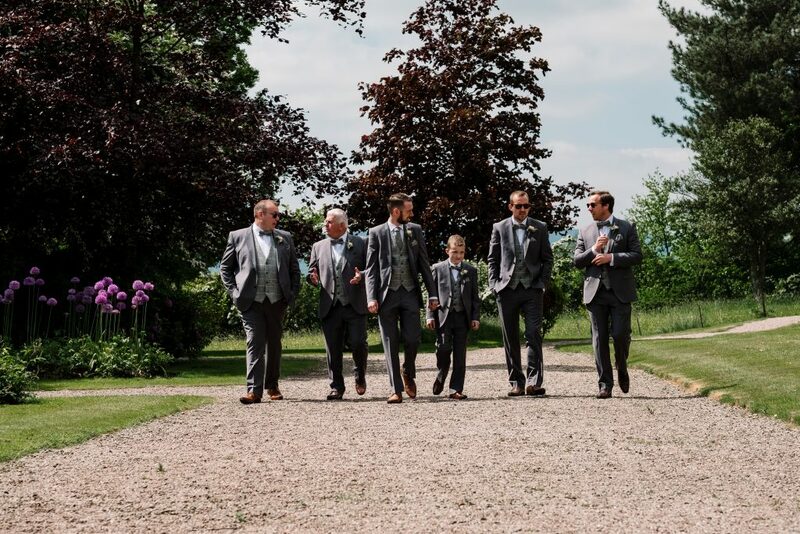 There’s plenty of space at Eaves Hall for shooting photos of the groom, his ushers and best man. 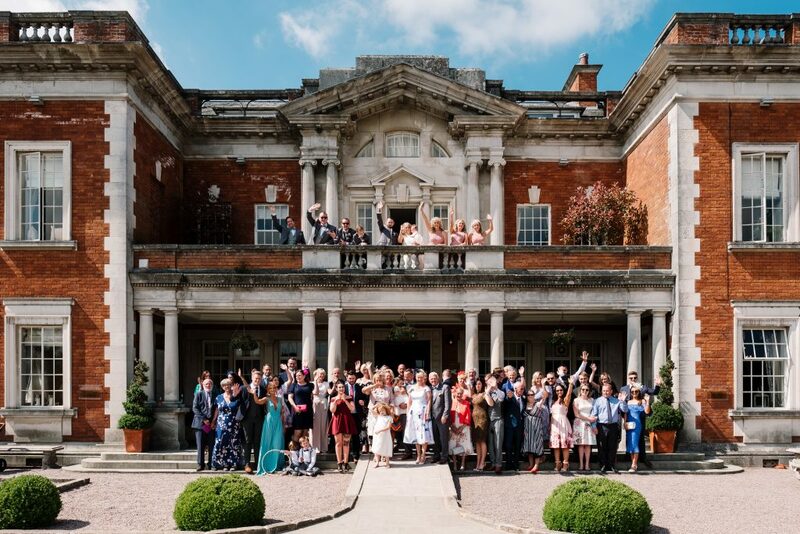 The gardens at Eaves Hall are great for informal group photos. 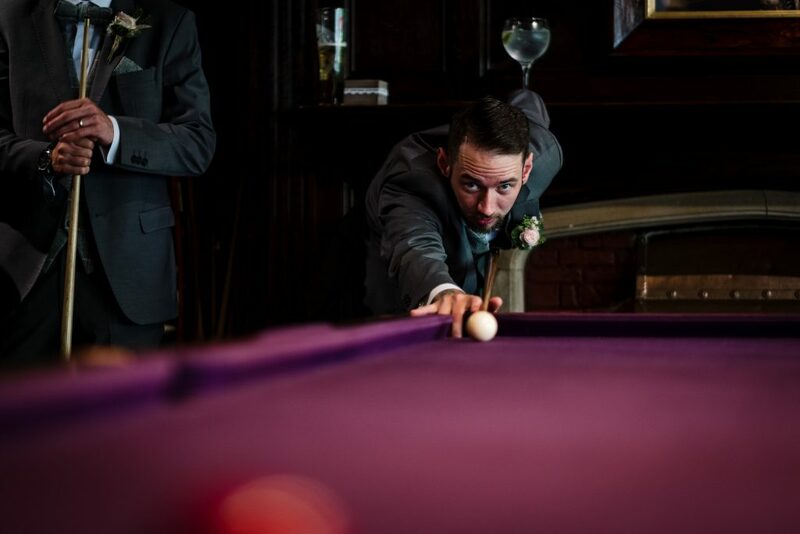 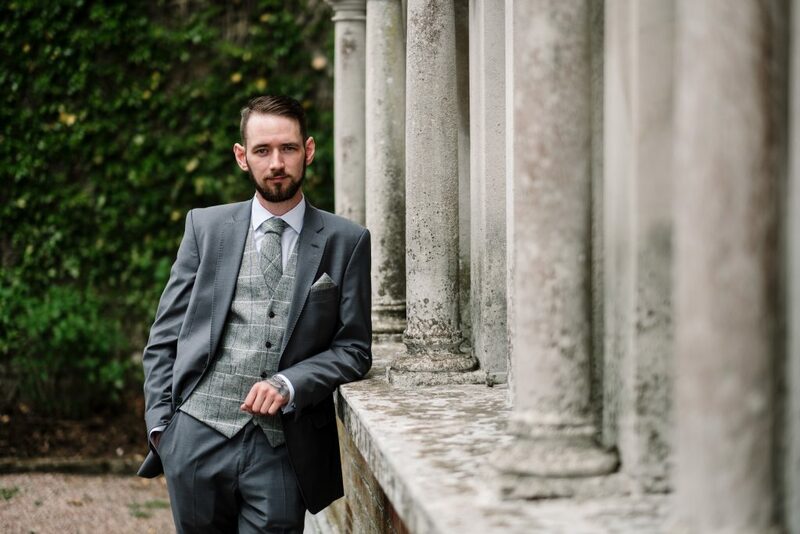 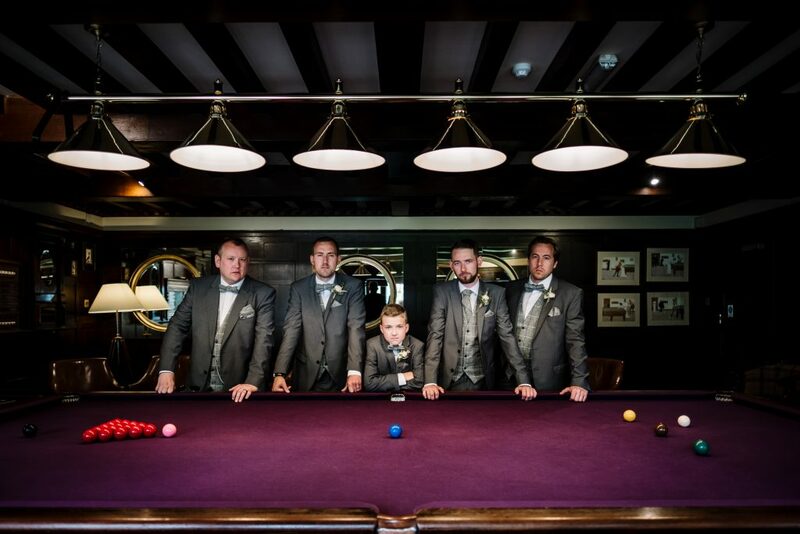 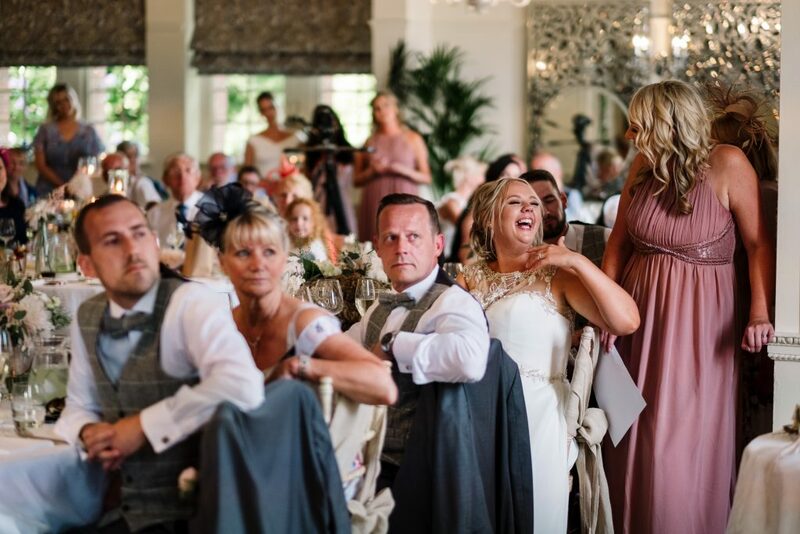 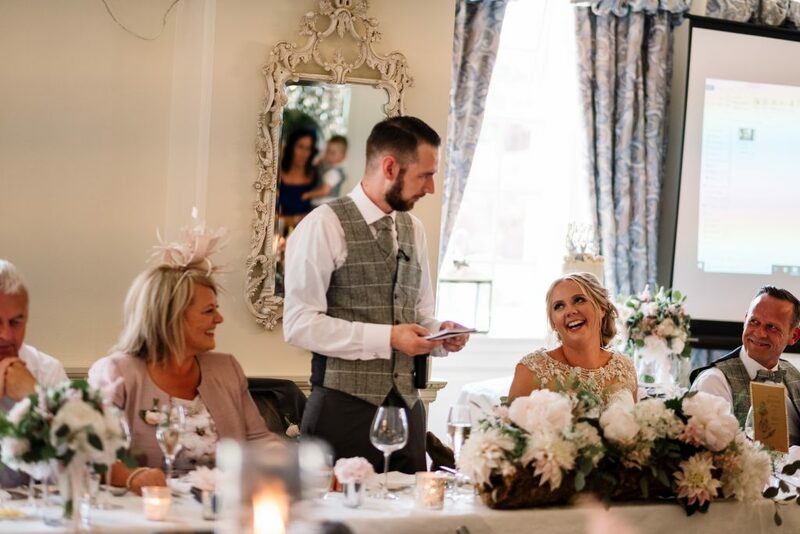 The pool room at Eaves Hall is a great space for photos of the groom, best man and ushers. 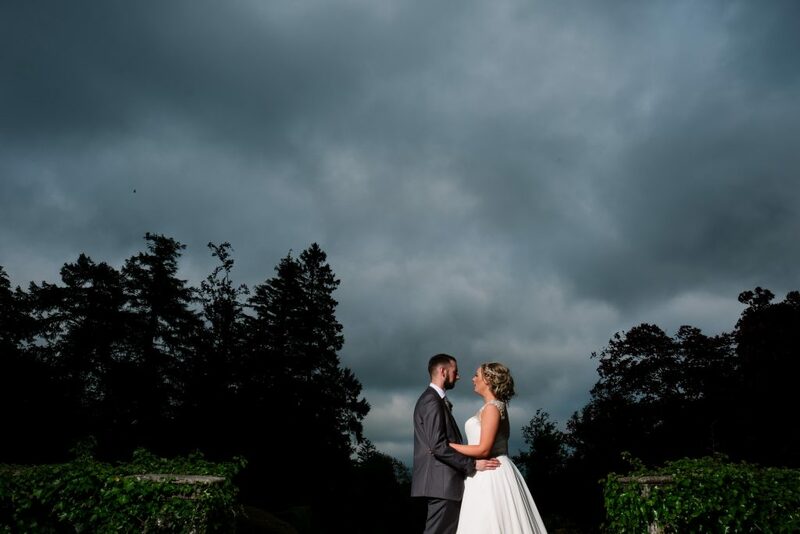 It’s quite a dark room and has a real moody feel. 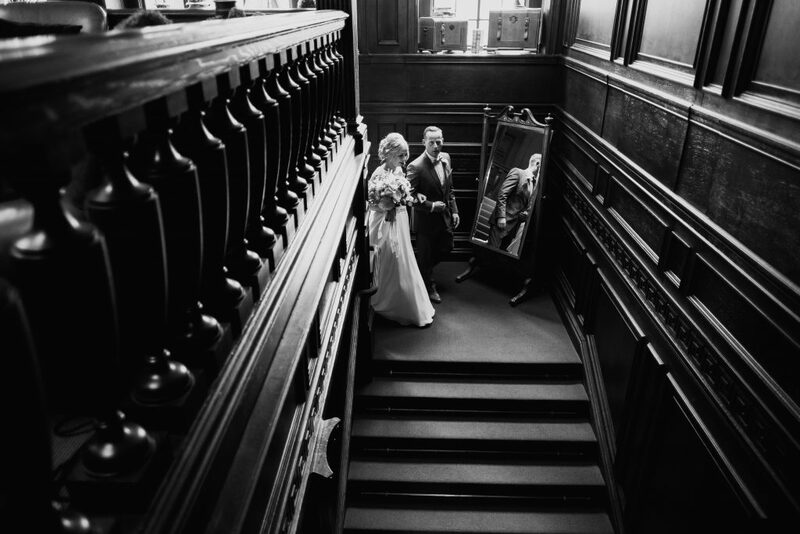 Bride Chelsea walks down the stairs at Eves Hall arm in arm with her dad. 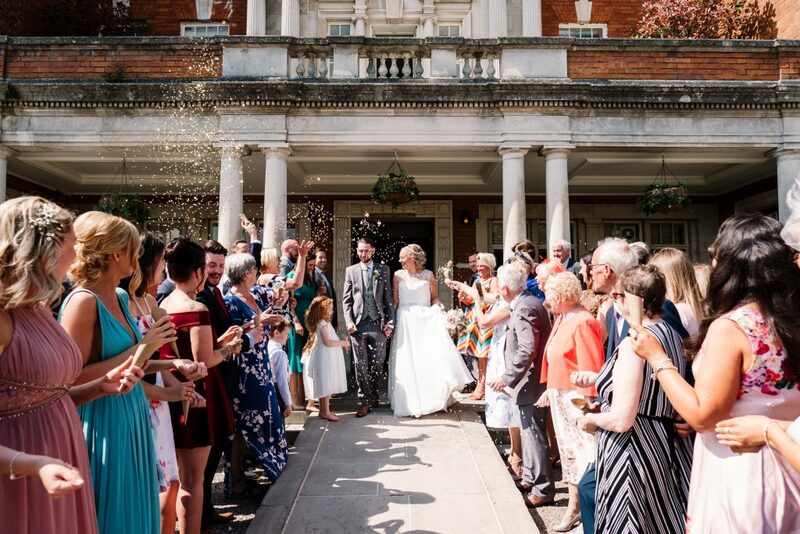 The weather has been fantastic this summer, and the day was warm and sunny enough for the bride and groom to get married outside. 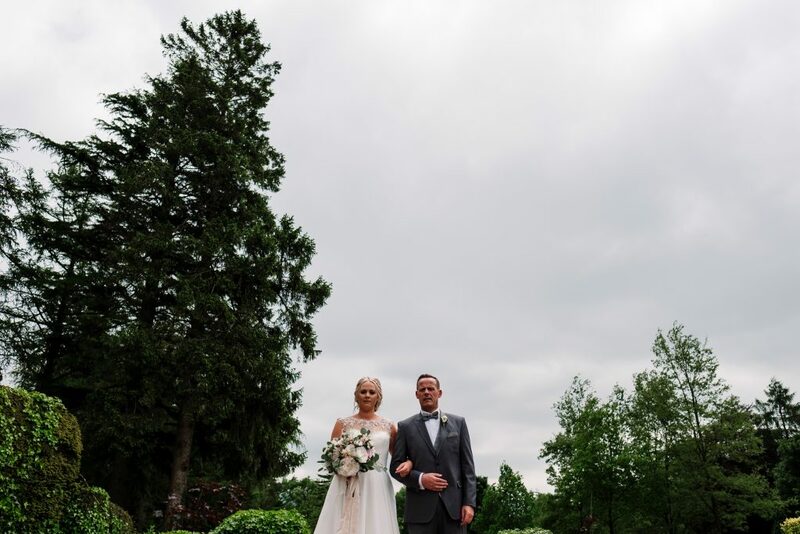 This is what the couple had hoped for, so they were both really happy that the weather was on their side! 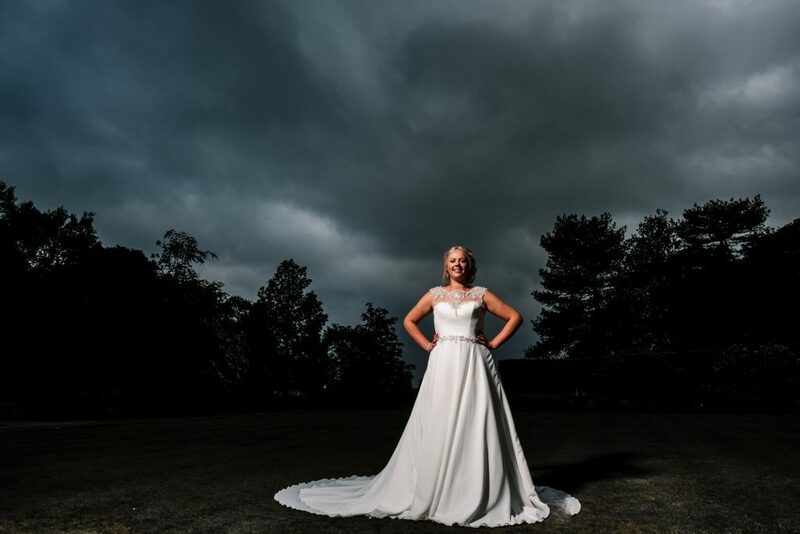 The weather was perfect for portraits in the gardens. 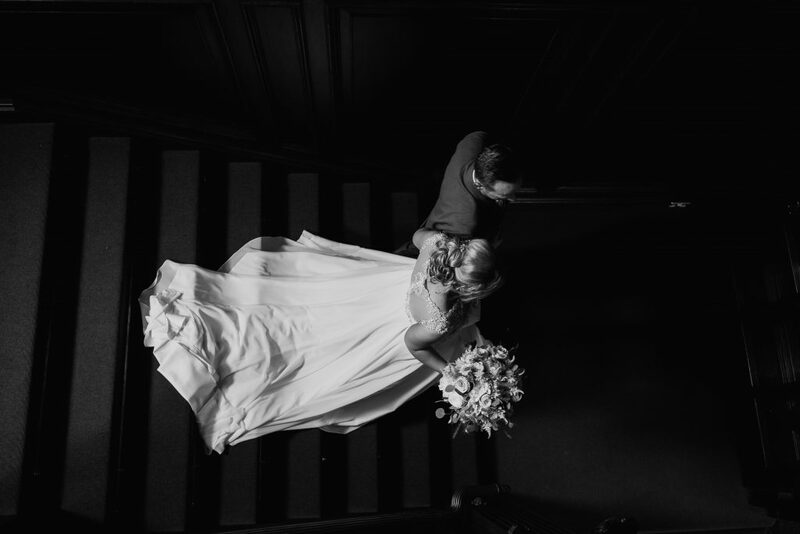 I shot this bridal portrait on the stairs at the couples Eaves Hall wedding. 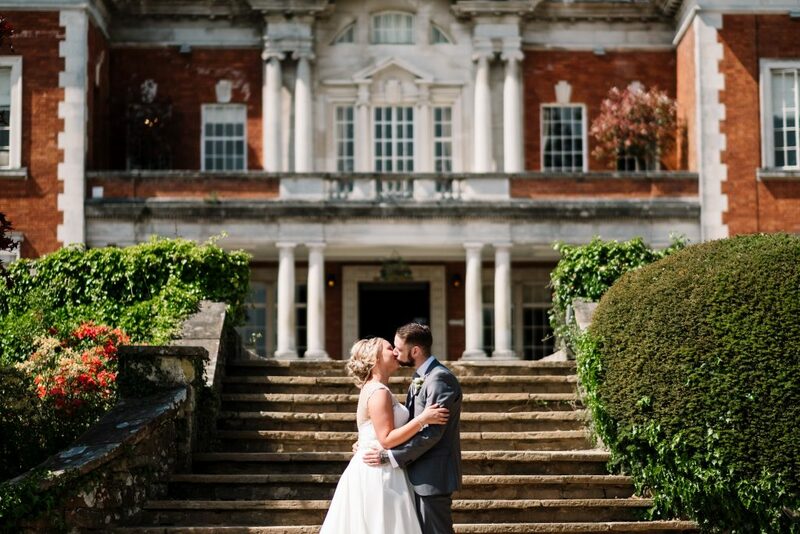 I love the symmetry with the hall and the stairs! 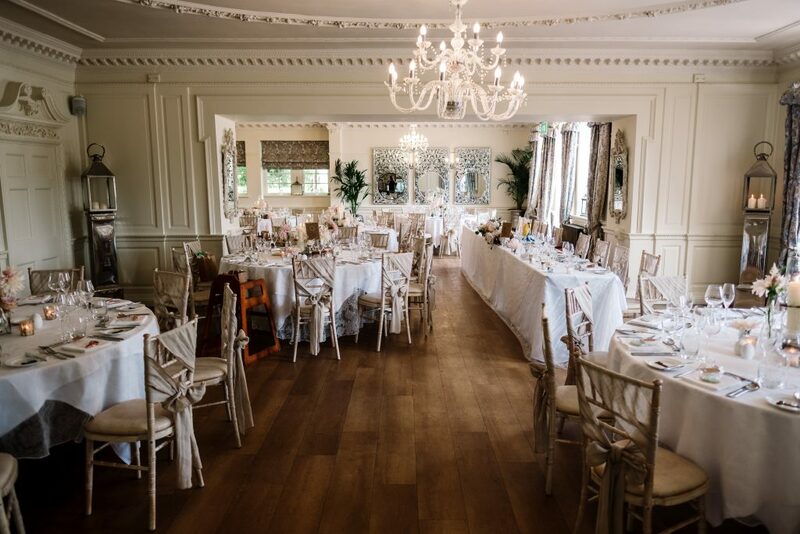 This space features Georgian period details and ornate chandeliers and is a stunning backdrop for a wedding breakfast. 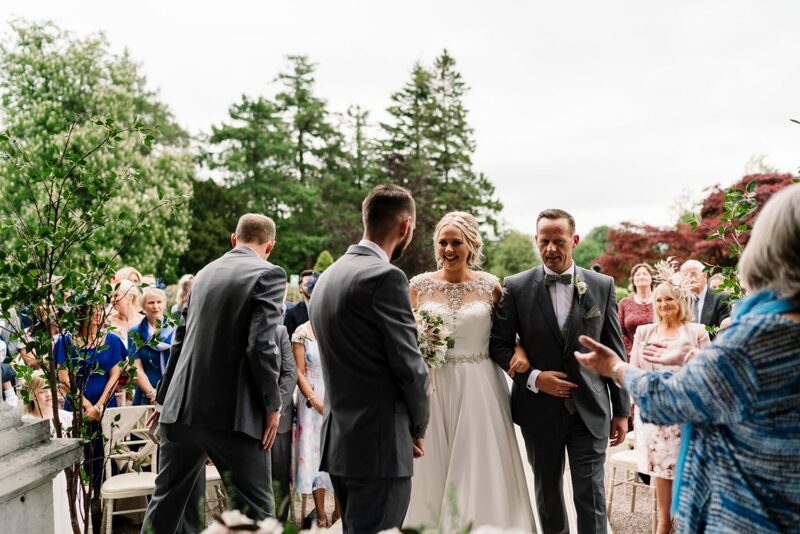 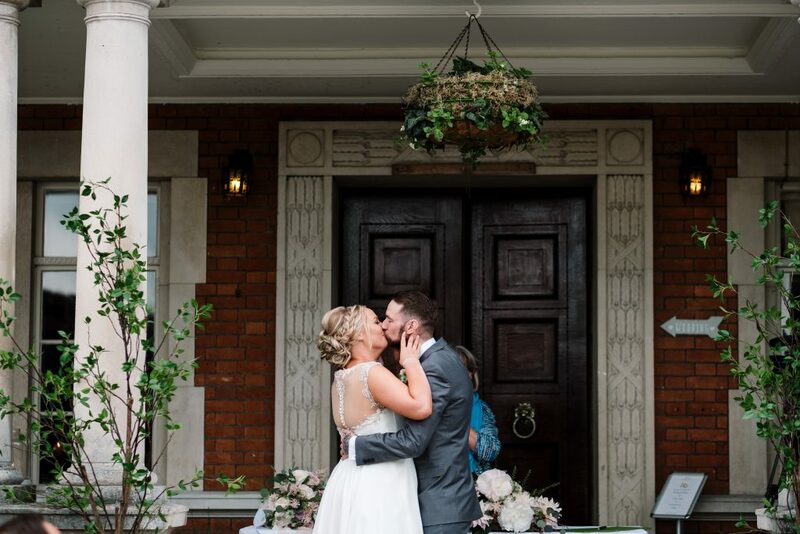 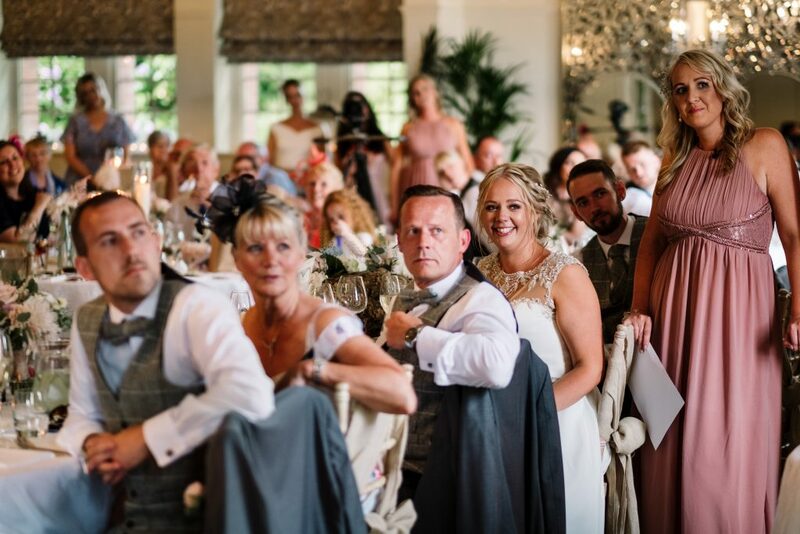 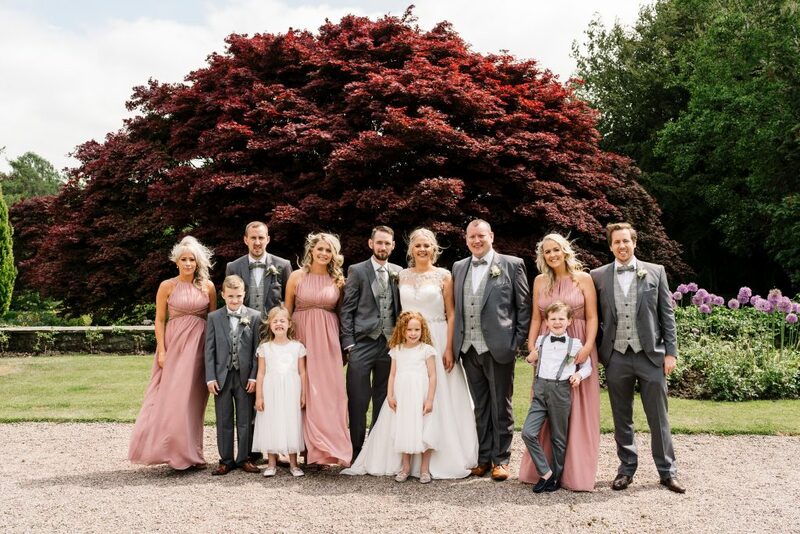 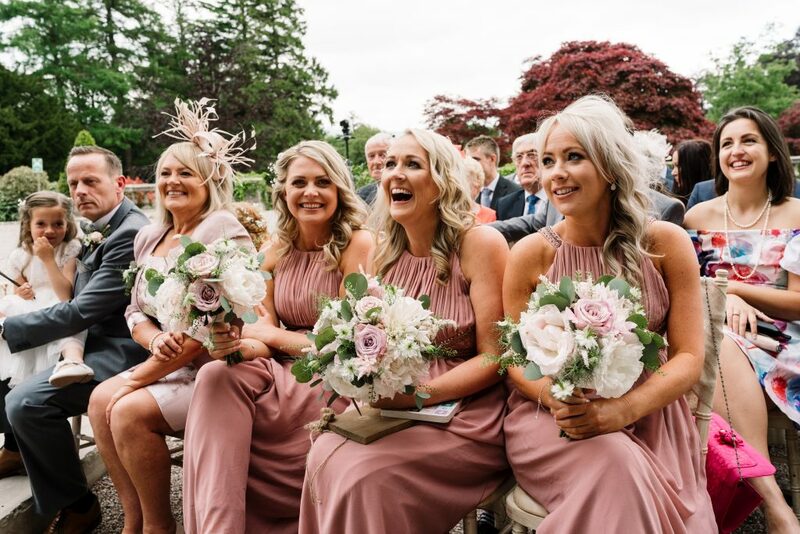 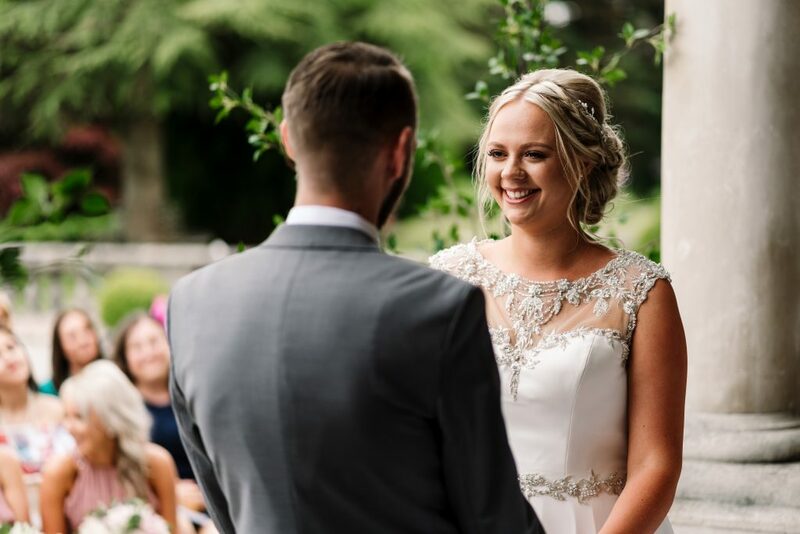 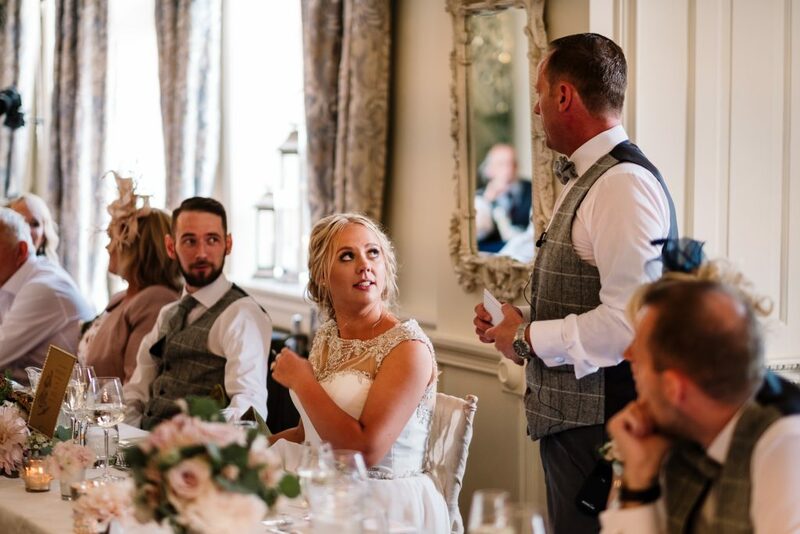 Chelsea and Ian had opted for sophisticated neutral colours that complimented the elegant surroundings. 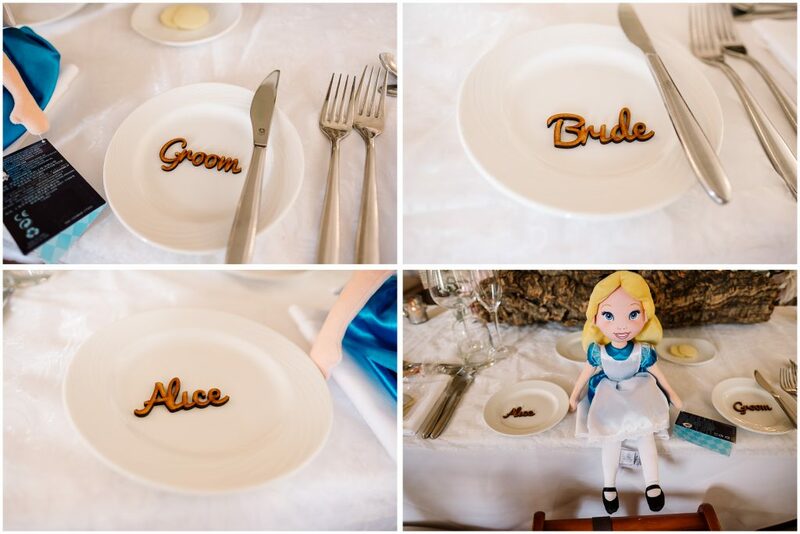 There was a subtle Alice-in-Wonderland theme which added fun detailing to tables and cake. 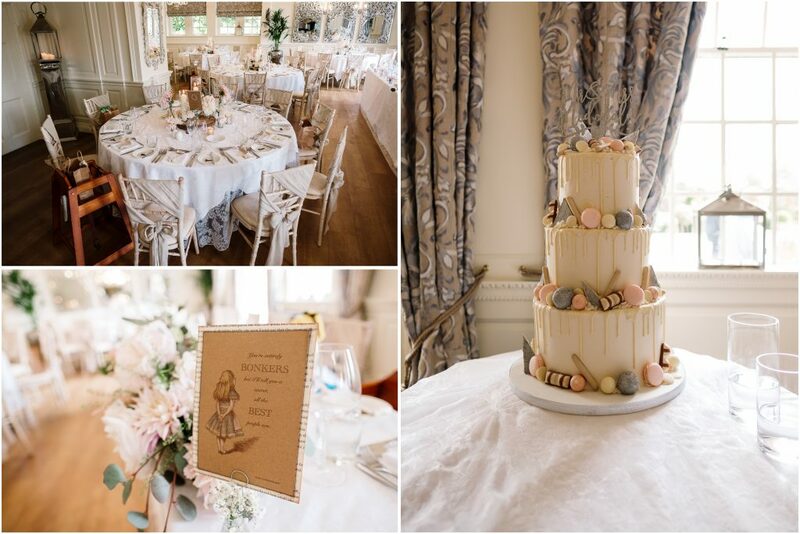 The wedding cake was a three-tier white chocolate drip cake, decorated with mini cakes, including French macarons. 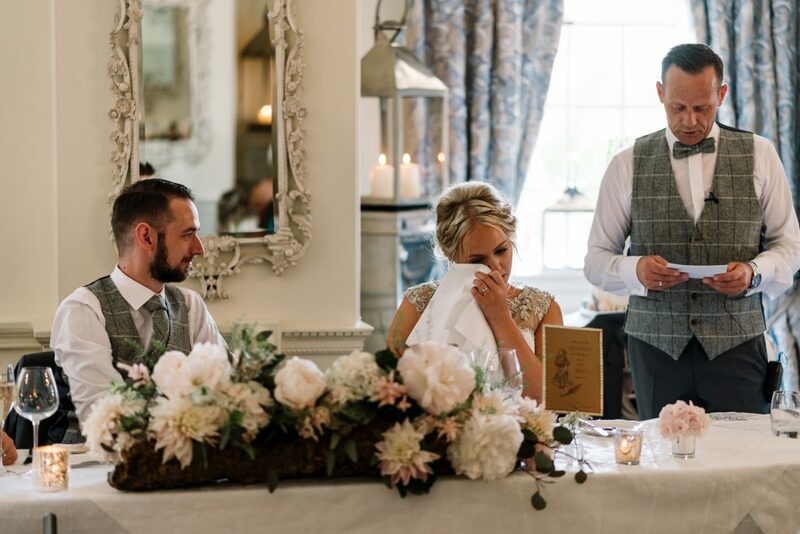 The dining room at Eaves Hall is flooded with natural light, perfect for natural documentary coverage of wedding speeches. 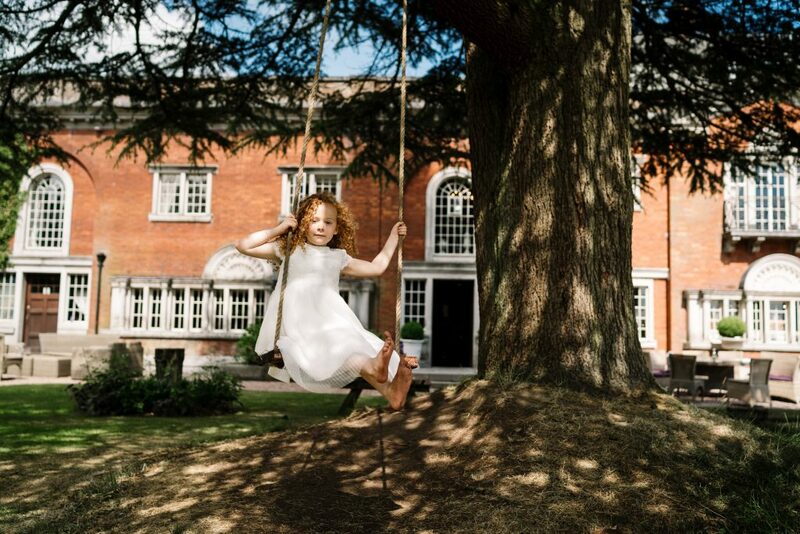 After the wedding breakfast, I shot some more portraits in the gardens at Chelsea & Ian’s Eaves Hall Outdoor Wedding. 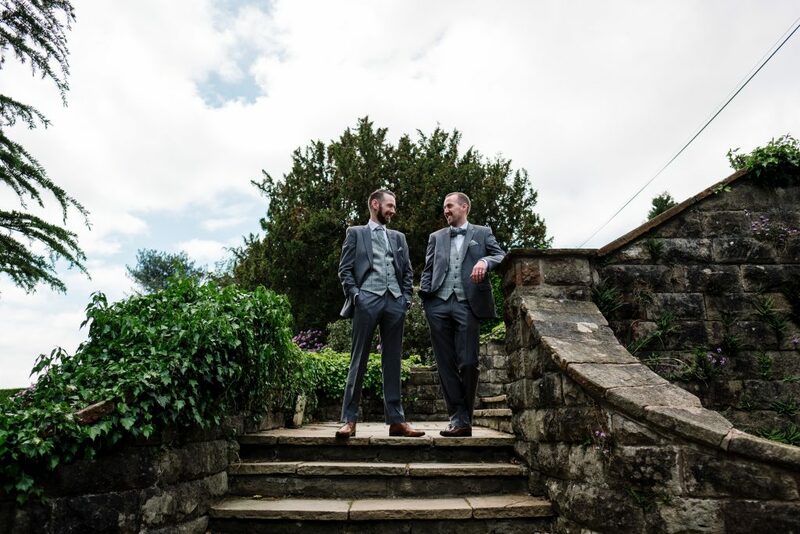 We really wanted to make the most of the space and the weather. 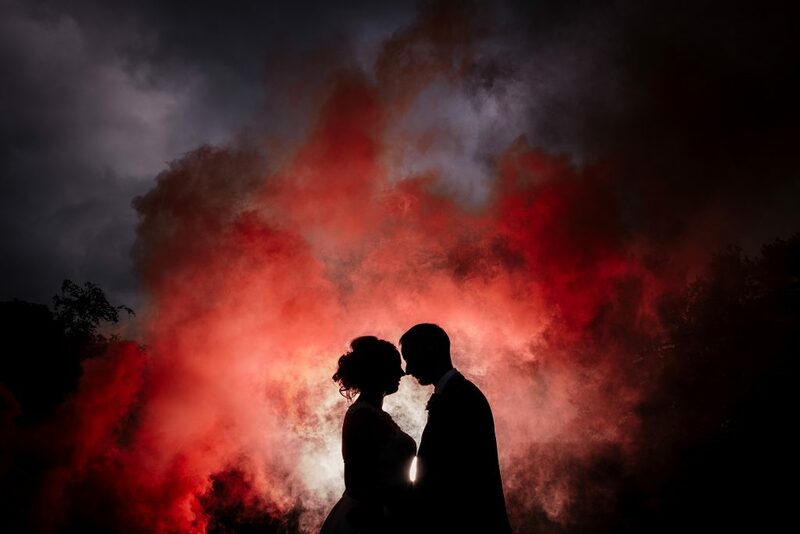 One of the things I love doing in the evening is creating some dramatic portraits using smoke bombs. 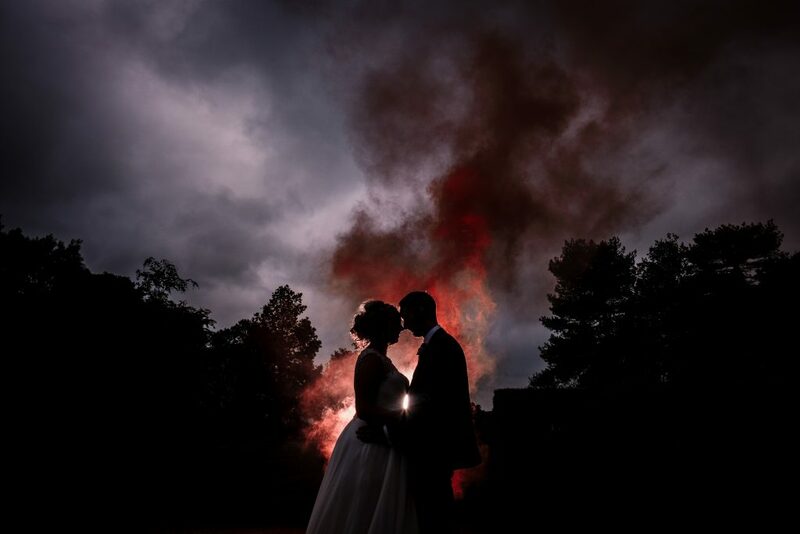 In these two photos, I created a silhouette with the red of the smoke creating a fiery sky look. 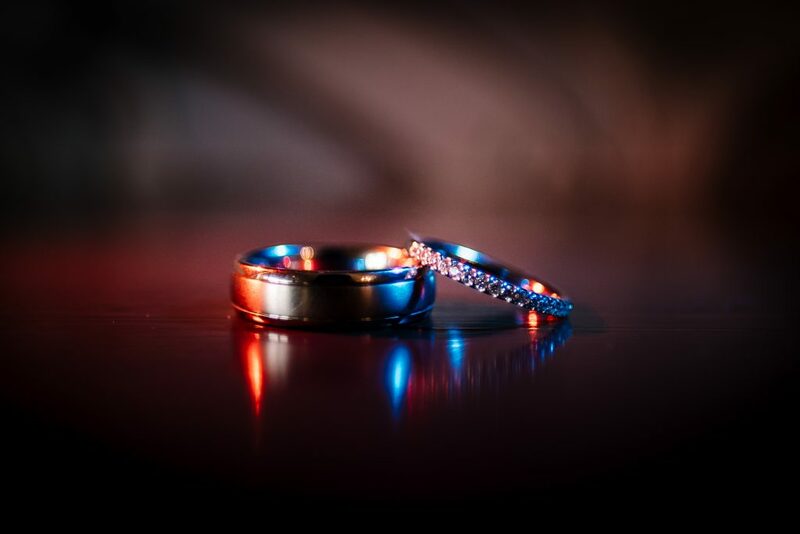 I find these are really popular with my couples, and it’s a fun experience at the end of he night. 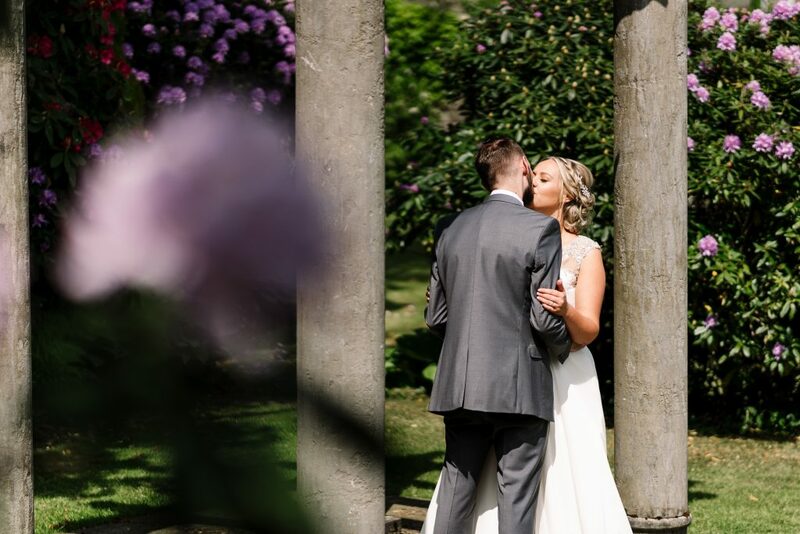 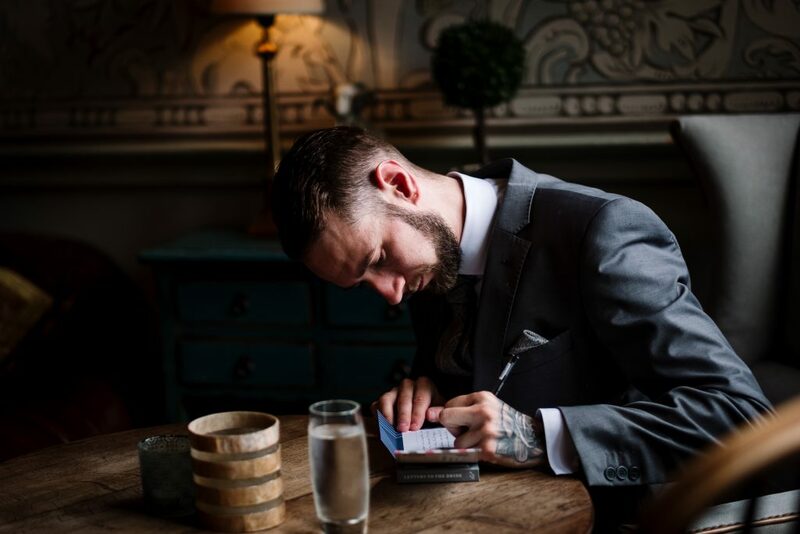 Find out more about Eaves Hall over on the Eaves Hall Website, or if you have already booked and would like to check my availability, complete the short form on my contact page.